In Talk: Nara Rohit's Facebook Campaign! Nara Rohit refrained from election campaigning for TDP in the Telangana Assembly Polls. He, however, begun social media campaign in favour of Telugu Desam and Mahakutami. The Young Hero has given a call to end the 'Opportunistic Politics' of TRS. He appealed people to vote for Nandamuri Suhasini in Kukatpally and other Candidates of Mahakutami. 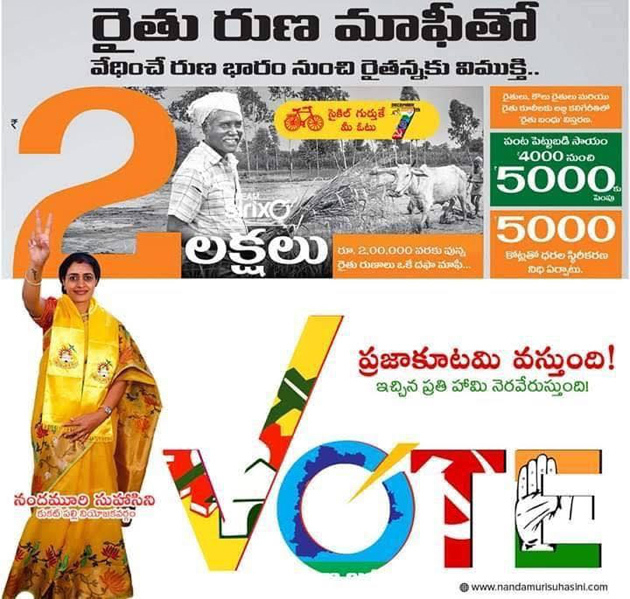 Rohit even shared a campaign poster consisting of Manifesto Promises such as Rs 2 lakh farm loan waiver, Rs 10,000 per year under Rythu Bandhu Scheme and Rs 5,000 crore fund for MSP. Last but not least, It have the caption - 'Praja Kutami Vasthundhi - Ichina Prathi Haami Neraverusthundi'. People of AP will be really happy if Nara Rohit talks about how many of the 2014 poll promises were implemented by TDP Government so far. Will he take the responsibility if People's Alliance fail to fulfill the promises? Strong Punches On PK, Balayya & Lokesh! Is T-Congress CM Candidate A Dalit?